​teNeues publishers have never failed to impress us with their beautiful photography books, and one of their latest titles, dedicated to the host country of this year’s Football World Cup, Brazil, is no exception which features photography by German portrait and fashion photographer Olaf Heine, who is much sought-after by fashion magazines and musicians for his carefully staged and detailed photographs (having collaborated with countless artists, musicians and bands, including Iggy Pop and Sting). Although the outcome of the World Cup semi-final earlier this summer has rendered it impossible to mention Brazil and Germany in the same sentence without causing a certain amount of tension (remembering Brazil’s loss to Germany 1-7), Heine’s book is such a serene and loving tribute to the country’s natural beauty and spirited people, that you all but forget the high adrenaline of championships and competition of indeed any kind from the moment you turn the first page. Christ the Redeemer, Rio de Janeiro, 2013. Photo © Olaf Heine. 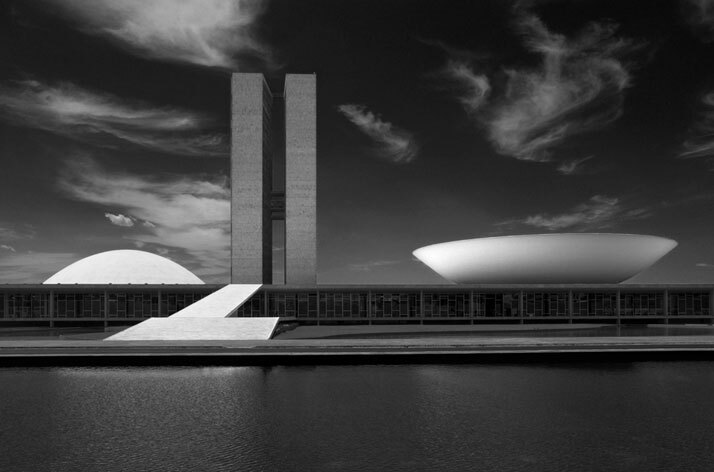 Olaf Heine’s fascination with Brazil was kindled by his early visits to the country in the 1990’s, a period during which he explored the work and legacy of one of the country’s legendary figures, the architect Oscar Niemeyer. The new ‘Brazil’ book however is the result of a more recent creative process, comprising pictures taken between 2010 and 2014 in Rio de Janeiro, São Paulo, Brasília and other locations in the country. While some of the images in the book were taken in Heine’s usual well-planned and ‘polished’ style (shot alongside other projects, usually working with professional models for local fashion magazines), for the most part the pictures in the book feel more spontaneous, combining the impromptu character of street photography with the well-trained eye of the experienced photographer where artists, dancers, musicians (some of them local celebrities) as well as children playing football in a dirt field or just common people on the beach are depicted. 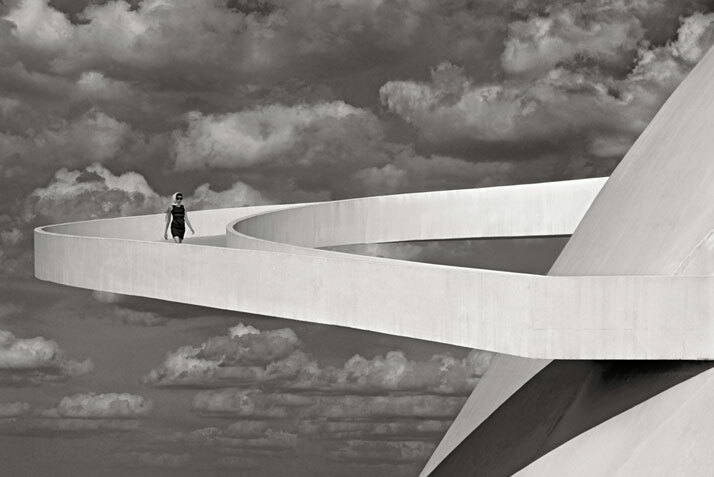 With that said, the book also includes one of the last portraits of Oscar Niemeyer ever taken, since the architect passed away in December 2012. In Heine’s ‘Brazil’, aerial photography of densely-populated favelas is juxtaposed with pure and minimal close-ups of human torsos and faces whilst local art and architecture is mixed with imagery from the jungle, the coastline and the desert –we see Niemeyer’s iconic modernist masterpieces put back to back with surfer’s boards and gun-bearing tattoo-covered gangsters. This kaleidoscopic visual journey is entirely presented in black and white – something unusual for portraying a country usually viewed as so “colourful” and vibrant by the foreigners who visit it. However, going through all these monochrome images is like leafing through a very intimate storybook full of emotion, such as one of the most spectacular images in the book, a two-page panorama of the Sambadrome (the famous Carnival venue, also designed by Niemeyer) at the very peak of the Carnival parade, where looking at this overwhelming fest of sound, dance and colour in a muted black and white panorama is like staring at a memory of a dream. The book begins with a Brazilian proverb, which states that ''those who leave will take saudade with them.'' 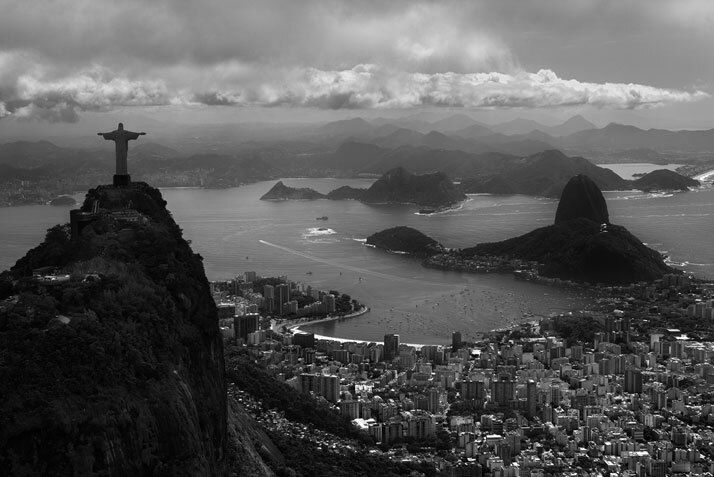 Knowing that the feeling of saudade has also been described as “the love that remains,” it is not hard to see how enamoured Olaf Heine is with Brazil, and how much love “has remained” from his journeys there. Indeed, turning the last page of Heine’s new book makes one understand what saudade really means. Julian and Fernanda, SaÌo Paulo, 2011. Photo © Olaf Heine. Girl Descending a Ramp, BrasiÌlia, 2012. Photo © Olaf Heine. 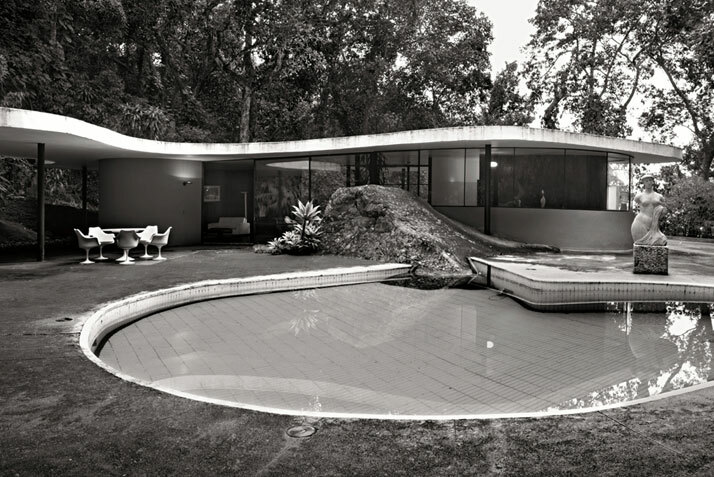 Oscar Niemeyer's Casa das Canoas, Rio de Janeiro, 2011. Photo © Olaf Heine. The National Congress, BrasiÌlia, 2011. Photo © Olaf Heine. 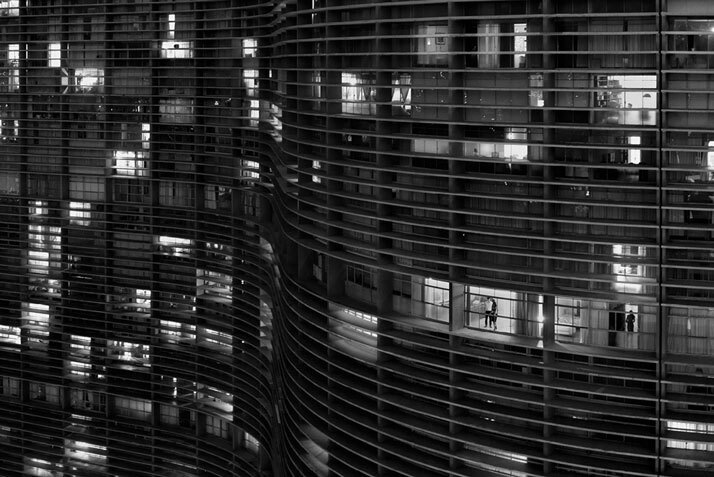 The Copan Building (Detail at Night), SaÌo Paulo, 2011. Photo © Olaf Heine. Taynara (Close-Up), Rio de Janeiro, 2013. Photo © Olaf Heine. 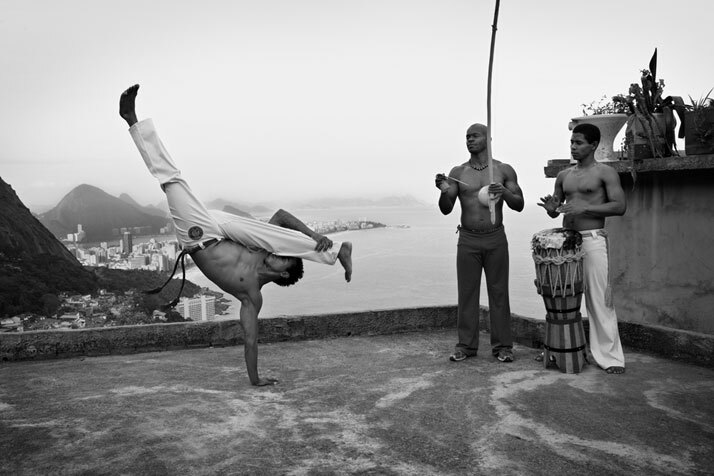 Capoeira, Vidigal, Rio de Janeiro, 2012. Photo © Olaf Heine. 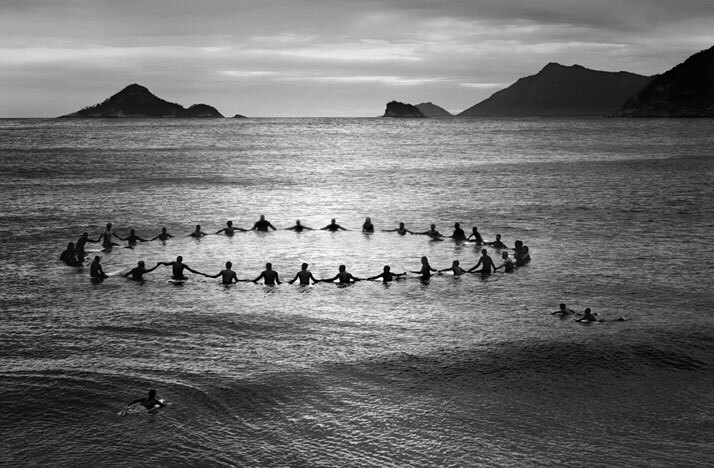 Paddle Out, Recreio dos Bandeirantes, 2013. Photo © Olaf Heine. 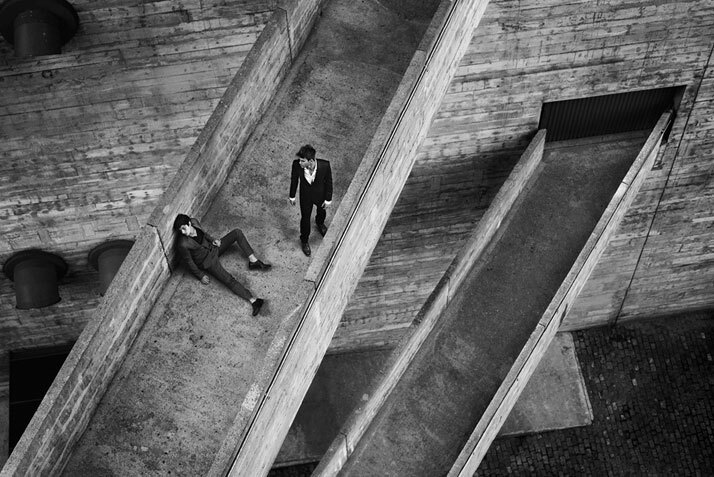 Two Men on the Ramps of the SESC Building, SaÌo Paulo, 2011. Photo © Olaf Heine. 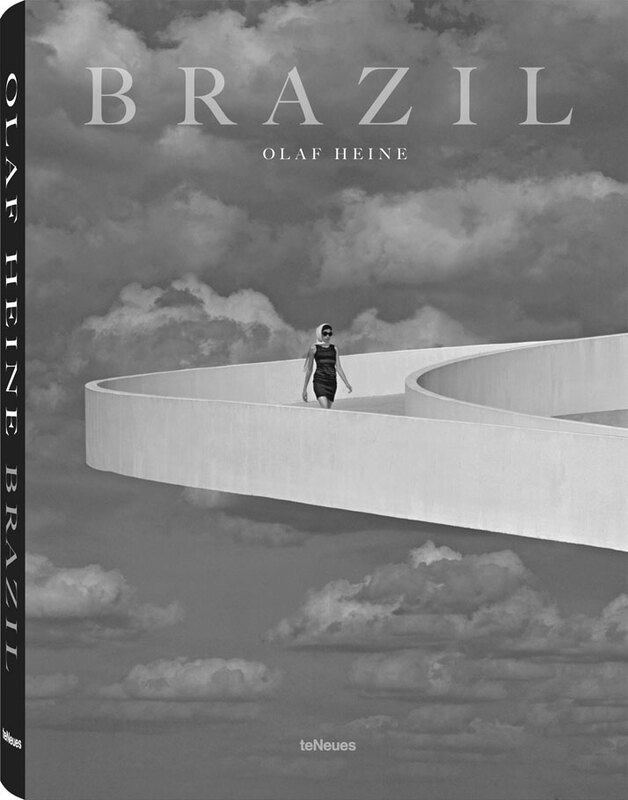 BRAZIL by Olaf Heine, book cover, © teNeues.